The Library is your central repository for all books, textbooks, CDs, DVDs, and any other materials used in your homeschool. Placing these items in the Library makes them available for use as Resources in your Assignments and Lesson Plan items. To access the Library, click or touch 'Library' in the 'Manage Lists' section of the HSTOnline menu. Library items can be entered manually, or you can use the ISBN look-up feature to find books in the Amazon or HSTOnline master library using the book's ISBN or ASIN codes. 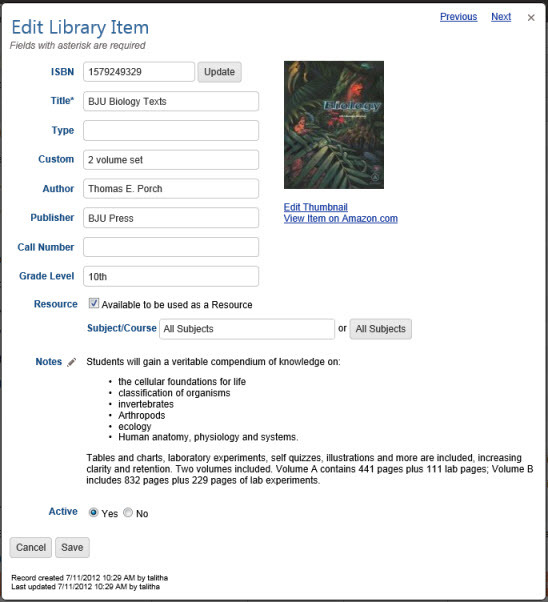 The ISBN/ASIN search can auto-fill the Title, Author, Publisher, Call Number and a Thumbnail of the book cover, when available. 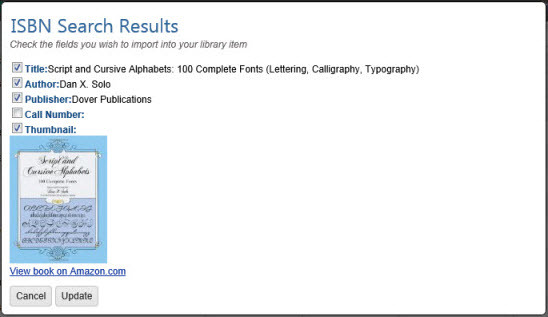 The Library list is sorted alphabetically by the Title field. You can group or sort by any column. The Active column shows a 'Y' if the Library item is active and an 'N' if the Library item is archived. To optimize performance, the Library displays no more than 500 items at a time. When there are more than 500 items to be displayed, the list will be divided into additional pages of no more than 500 items each. Searching or filtering a list will search the entire list, not just the items currently in view. For more information on paging, please see: Customizing the Data Display: Automated Paging. Add: Add one or more items to the Library list. This action is always available. Copy: Copy the details of an existing Library item to aid in the creation of a new one. This action is available when one Library Item is selected. Edit: With one Library item selected, this action becomes available. Choose edit to change any field of the item. Multi-Edit: With two or more Library items selected, this action becomes available. Choose this option to edit the Type, Custom, Author, Publisher, Grade Level, Resource setting or Active status for all selected items. Export: Exports the filtered Library list to a .CSV file which you can then use as needed. This action is always available. Delete: With one or more Subjects selected, this option becomes available. Choose this option to permanently delete the selected items from your database. Choose Columns: Click or touch this option to select which fields will be displayed in the Subjects list. You must select at least one column. Filter: Click or touch this option to select which types of Library items will be displayed. You can choose between Both, Resources only or Non-Resources only and between Both, Yes (Active only), or No (Archived only). So if you choose Resources only and Active only, just those Library items which are designated as Resources and are set as Active will be displayed. The default selection shows Active Library items, whether they are designated as a Resource or not. When anything other than Both is selected for either option, the Filter Settings badges show which types of items are being displayed. Search Box and Go Button: Use the Search box to enter text and click the Go button to find Library items matching your entry, searching the Title, Type, Custom, Grade Level, Author, Publisher, Resource, and Notes (preview) fields, even if any of those columns have been hidden. Only the text visible in the Notes (preview) field will be searched. HSTOnline will do an exact search for whatever text you enter. Leave the search box blank and click Go or click or touch the Search text badge to return to the full list of Library items. Viewing: Indicates the number of Library items being displayed out of the total based on the current settings. Select All: Click or touch this badge to quickly select all the Library items in the list. Selected: When one or more Library items are highlighted, this badge will appear to show the number items selected. Click or touch this badge to deselect all Library items. Filter Settings: If you have limited the types of Library items to be displayed, the filter badge will appear showing the types of items being displayed - either Listed as Resource, Not Listed as Resource, and/or Active Only or Archived Only. Search text: Shows the text entered into the Search box which is limiting which Library items are displayed. Click or touch this badge to clear the text from the search box and remove that limitation. Title is the only required field for a Library entry. You may enter just that information (up to 150 characters) and then click or touch the Save button for a minimal entry. You can always come back later to add to the entry. On the HSTOnline menu, click or touch Library under the 'Manage Lists' section. On the Library page, click or touch the Action button and choose Add to open the Add Library Item window. ISBN: If your item has an ISBN or ASIN, you can enter it here and click Update to search for the item. If the item is found, the Title, Author, Publisher Call Number and Thumbnail, as returned by the search, will be added to the form. You can edit any of this information as you like. If the item is not found, HSTOnline will display the 'Unable to find a match for that ISBN/ASIN' message. You can enter the rest of the fields manually as needed. Title: This is a required field. If not auto-filled via the ISBN/ASIN search, you must enter something here, up to 150 characters. The Title must be unique - no duplicates are permitted. Add any additional information as desired for this item. These fields are all optional. Type: Enter the type of item: book, textbook, workbook, reader, etc. Custom: This 150 character field allows you to classify the book in a way that is meaningful to you. Grade Level: Note the grade level of the library item for classification purposes. Resource: The box is checked by default, making this Library item available in the Resource selection list when you are creating Assignments and Lesson Plan items. 'All Subjects' is the default selection. you can generate a Resources report which lists titles by Subject or Subject/Course for your records. you can limit the list of Resources to choose from when adding Assignments or Lesson Plan items. To change from the All Subjects setting, highlight the text and begin typing the name of a Subject or Course. HSTOnline will display a list of Subjects and Courses that match your selection. Click or touch on the entry you want to attach to this Library item or continue typing to create a new Subject or Course. Your new entry will be confirmed when you save this item. Notes: Click or touch the Notes field name or pencil icon to enter further details about the Library item. In the Library list view, you can choose to view the Notes (*) column - which simply shows an asterisk (*) when notes have been entered for that Library item - and/or you can choose to view the Notes (preview) column - which will display, in plain text, the first 150 characters of whatever notes have been entered for the Library item. Edit Thumbnail: If there is no image available from the ISBN lookup, or if you simply want to log a different image in your records, use this link to direct HSTOnline to the image you want. Smaller is better, but there is no specific size requirement. View Item on Amazon.com: If the item was loaded via the ISBN lookup, this hyperlink will appear. Use it to quickly access the item on Amazon.com. Active: All new Library Items start as Active. Click or touch the No radio button if you want to archive this Library Item. You may change the status at any time in the future by editing the Library item. Save to add this item to your list of Library items. The 'Add Another' hyperlink in the top right corner to save this item and add another Library item. You can click 'Add Another' each time until you have entered the last new Library item and then click the Save button to end the Add process. The new Add window will show the last Subject/Course selected. You may change that as needed. If you have created a new Subject or Course in the Resource area, HSTOnline will ask for clarification when you click or touch the Save button or the 'Add Another' link. Choose whether to create your new entry as a new Subject or a new Course. Add as new Subject: the new entry will be added to your Subjects list with a status of 'Core'. You can edit the item in your Subjects list to change the status as needed. You can edit the item in your Courses list to change the parameters as needed. Cancel to be returned to the Add Library Item window to make a new selection in the Subject/Course field. Save to keep the new Subject or Course and add the Library item to your list. Click or touch the green Added Items notification or refresh the page to see your updated Library list. You can copy an existing Library Item to use as the basis for a new item. If you have multiple items by the same author, you may wish to create the new entries by copying an existing entry for that author and changing just the Title and whatever other fields are needed. On the Library page, click or touch the item you want to copy and then click or touch the Action button and choose Copy to open the Copy Library Item window. HSTOnline will present you with the duplicate Library Item with '-Copy' appended to the Title field entry. Make any changes needed to create the new Library item. Choose whether to create your new entry as a new Subject or a new Course. If you choose to create it as a Course, you will need to choose which Subject to tie the Course to. New Subjects will be added as Core and Active. Go to the Subjects list to edit the new Subject as needed. New Courses will be added with 0 Credit Hours, the Basic Calculation Option, and tied to the Default Grading Scale under the Subject you have selected. Go to the Course lists to edit the new Course as needed. Click Cancel to be returned to the Add Library Item window to make a new selection in the Subject/Course field. Click or touch Save to keep the new Subject or Course and add the Library item to your list. You can edit any single Library item to change any field, or any group of selected Library items to make the same change to the Type, Custom, Author, Publisher, Grade Level, Resource or Active fields. On the Library page, double-click on the item you want to change to open the Edit Library Item window. Alternatively, you can click once on the item you want to change and then click the Action button and choose Edit to open the Edit Library Item window. On a touch device, touch the item you wish to edit and then touch the Action button and touch Edit to open the Edit Library Item window. Make whatever changes are needed. 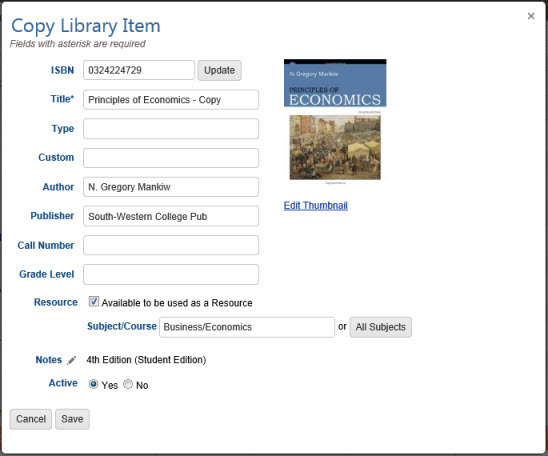 ISBN: If you edit the ISBN field of an existing Library item and click or touch the Update button, the search results will be returned in a separate window, allowing you to select which fields you want to use in your Library item. All fields in the Search Results form are checked by default. Remove the checkmark for any field that you do not want to import into your Library Item by clicking or touching the checkbox or field name. Cancel to return to the original item without importing any of the returned information. Update to import data from the check marked fields and return to the Edit Library Item window. To change the Active status this Library Item, click or touch the Yes radio button to make the Library Item Active; click or touch the No radio button to Archive the Library Item. Cancel to abandon the changes and close the Edit Library Item window. Save to commit the changes to your Subject and close the Edit Library Item window. Click or touch the Previous or Next hyperlink in the top right corner to save your changes to this Library Item and move to the previous or next Library Item in the list. You can click or touch Previous or Next until you have made all the changes you want to your Library Items and then click the Save button to end the Edit process. If you reach the beginning or end of the list when clicking or touching Previous or Next, the Edit window will close and you will be returned to the list view. If you have created a new Subject or Course in the Resource area, HSTOnline will ask for clarification when you click or touch the Save button or the 'Previous' or 'Next' links. Cancel to be returned to the Edit Library Item window to make a new selection in the Subject/Course field. Save to keep the new Subject or Course and update the Library item. On the Library page, select the items you want to change. You can use the Grouping and Sorting, Filter and Search features to isolate the items you want to change. You can use your mouse to click and drag over contiguous Library Items in the list to select those items. On a touch device, you can touch and drag your finger over contiguous Library Items in the list to select those items. Click or touch the 'Select All' badge to select all the Library Items in the list. Click or touch the Action button and click or touch Multi-Edit to open the Multi-Edit Library Items window. 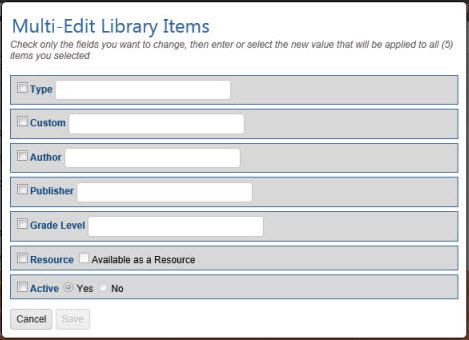 To enable the form, click or touch the box to the left of each field you want to change for all selected Library Items. Make your selection for each of those fields. 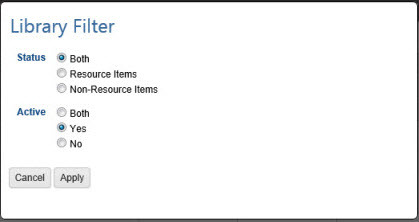 To change the Resource designation, you must select from an existing Subject or Subject/Course when in multi-edit mode. Cancel to abandon the changes and close the Multi-Edit Library Items window. Save to commit the changes and close the Multi-Edit Assignment Library Items window. You can use the Export feature to create a .CSV file of the displayed Library items. You can then use the data in the file in whatever way you need. The data file will include all items currently in view in the Library list. The data file will include all columns, even those currently hidden from view. Customized Grouping and Sorting settings will be ignored. All items will be displayed in alphabetical order by Title. Use the Filter and Search features to isolate the items you want to export. When the file is ready, your browser will prompt you to open or save the file. Each browser has its own way of handling export files. The program used to open the file will depend on your computer settings for CSV files. Typically, they are opened in a spreadsheet program. You can delete any Library items which have not been used as a Resource in an Assignment or Lesson Plan item. Library items which have been used as Resources can be removed from the active list using the Archive feature. Deleted items cannot be retrieved. On the Library page, click or touch the item you want to remove and then click the Action button and choose Delete to open the Confirm Delete window. 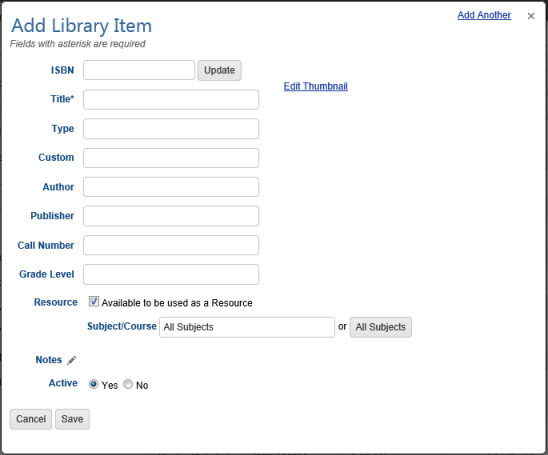 If the Library item is being used as a Resource in Assignments or Lesson Plan items, you will see a message that the selected item cannot be deleted. Click or touch the 'Never Mind' button to return to the Activity List. From there you can choose to archive the Library item to hide it from your list. On the Library page, select the items you want to remove. You can use the Grouping and Sorting, Filter and Search features to isolate the items you want to remove. Click the checkbox for each Library item you want to remove. 'Yes, I'm Sure' to complete the deletion process. HSTOnline will delete any of the selected Library items which are not being used as a Resource in Assignments or Lesson Plan items. Items that are in use will not be deleted. Archiving allows you to hide Library items that will not be used in the current year while preserving records from previous years. When you archive a Library item it will still be attached as a Resource to any Assignments or Lesson Plan items where it was selected previously. It will no longer be available for selection for other items unless and until you choose to reactivate it. 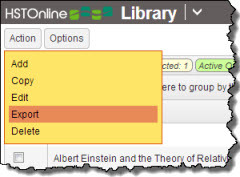 Use the Edit or Multi-Edit directions above to change the Active status of your Library Items.